Bogra Autism Care Centre (BACC) is a volunteer organization established in the year 2008 at Jaleswaritola, Bogra. 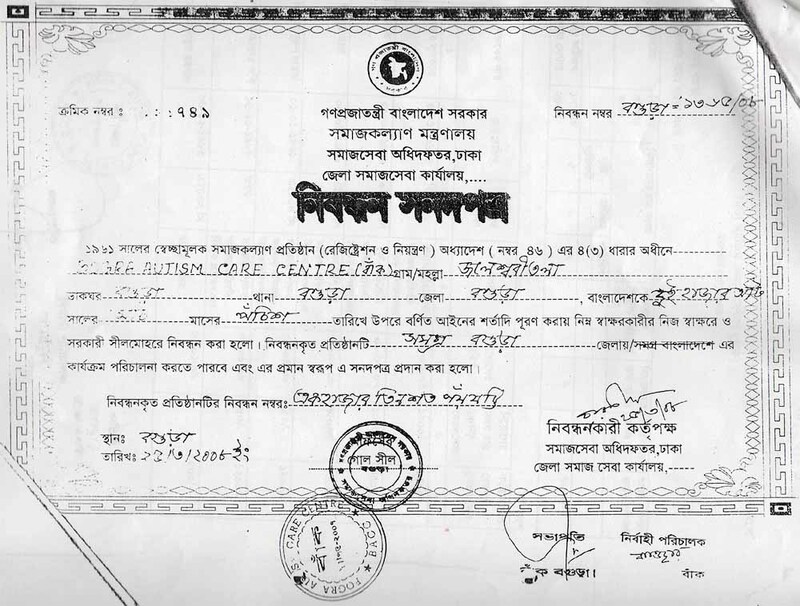 BACC has got the registration number 1365 from the Ministry of Social Welfare, Government of Bangladesh. Autism is a disorder of neural development characterized by impaired social interaction and communication, and by restricted and repetitive behavior. "Mentally handicaped children with autism and down syndrome need a lot of love. Their parents are always anxious about them. The kids always need extra care" said the director of BACC, Kaosar Jahan Ratne recently in an interview. Ratna a young mother was trudging along a mountian path. When she saw her second child (boy) could neither speak, nor walk normally. She went on a battle for life with her disabled child. She came forward to the aid of other children too. She started teaching 20 students everyday along with her own child. Instead of having her spirit broken she got stronger. She set up a special institution to help children with Autism and Down Syndrome. She gave the name of the institution 'BACC'. The name, meaning 'bend', signifies the turning of lives - New light in a new turn - She gave these kids the affection and care they could only receive from a mother. In her care, there are no differences between her own child and others. Ratna goes from house to house looking for kids with special needs. She requests parents to visit her school and check out the activities. A lot of them do visit. However, most of them don't. Due to social stigmas, a lot of them are embarrassed to bring their kids here. Some of them think of their disabled children as burdens. Ratna tries to change the attitude towards these kids in her school. She counsels parents too about how they should be treating their kids. There is special counselling and treatment for kids with autistic cerebral palsy and Down Syndrome. There are exercises that get these kids better. Teachers and Staff: There are four trained teachers in this school. The children learn how to say their names, the names of their parents, how to say words and sentences, drawing pictures, putting on clothes, participating in cultural activities. Everything is taught in a family-like atmosphere. These kids are getting pretty independent. They are not only actively socialising, they are also singing, dancing, making art and playing sports. Activities: BACC really wants their kids to know the realities of the world outside of the school. Every three months they take their autistic kids out on an excursion to the outside world. They go shopping, they meet people. They learn to do everyday things. The classes take place from 09:00 in the morning to 14:00 in the afternoon. Every kid has his or her own profile. They get regular checkups from a physiotherapist. Target: Even though this institution came up entirely out of personal initiative, in 2008 it was included as part of the Health Ministry. The fee is taka 500 monthly. 'BACC' is moving forward at a fairly steady pace. Director, Kaosar Jahan Ratna has faced her share of obstacles along the way- not enough space, not enough students. But she says she didn't come this far to just give up. She wants to turn this into a residential school some day. Autism is not something that you can "CURE" but it is Treatable; Your Support Is Changing Lives! Please Help our KIDS!